An institution known for its high-quality education would not go about creating a campus-wide recycling program without significant research and planning. This is most certainly the case at Yale University, which initiated a recycling program in early 1990 and since then has gradually developed the program to meet the needs of its population. Yale’s 200 buildings house traditional offices and classrooms, a medical school, scientific laboratories, student residences, dining halls, power plants, athletic facilities, museums, and performance halls. The recycling program had to be adapted for each type of building to serve approximately 19,000 people, including students, faculty, and staff. In April 1990, a 36-day pilot program was initiated in Calhoun College Dining Hall, which serves approximately 250 students. Employees collected steel and aluminum food and beverage cans, glass bottles, and HDPE plastic containers. At the end of the pilot program, all materials were brought to the Freddy Fixer recycling center in New Haven. At the center, the materials were weighed and assessed by volume. In the 36-day period, 281 pounds of steel and aluminum cans, 1196 pounds of glass bottles, and 21 pounds of HDPE plastic bottles were collected. This means that in 36 days, each student produced approximately two pounds of dining hall recyclables. This also means that Calhoun produces approximately 100 pounds of recyclables each week and that five thousand undergraduate students with meal contracts will produce approximately 2,000 pounds, of one ton of recyclables, during a week of normal dining hall operation. After the pilot program was completed, a recycling program was gradually established to include all of the dining halls. Another recycling program involves the use of 30-gallon recycling containers, which are 30-inches tall and 16-1/2 inches wide. The narrow containers were chosen to fit in the limited space of the buildings on campus. The containers are labeled and color-coded for: (1) cans and bottles, (2) office paper, and (3) newspaper. Since they are lined with bags, maintenance workers can easily and efficiently empty the containers, place the recyclables on a flatbed truck, and unloaded them into the appropriate 40-yard roll-off containers or take them to the local recycling facility. Many Yale students were already accustomed to recycling since a student group called Yale Recycling has been collecting cans, bottles, and paper for recycling since the late 1970’s. Now, even though the recycling containers are provided by the university itself, the student group still participates in the recycling process. Recycling at Yale both serves an environmental purpose and assists in community development projects. For example, Outdoor Corps, a youth group led by Yale undergraduates, frequently helps to collect and recycle beverage containers from the residential colleges at Yale. The solid waste problem is not unique to one or two states or even to the United Stats only; other countries, such as the United Kingdom, are encountering similar challenges and implementing similar solutions - namely, recycling. Attwoods, Inc., under the banner of Community Recycling, is providing a range of recycling services to a number of communities in the United States and Europe. A British company with United States operations headquartered in Coconut Grove, Florida, Attwoods has developed more than 45 recycling programs in the United States, more than doubling last year’s total. Municipal programs are tailored to each community’s unique needs. Such programs may include all or some of the following: (1) source separated or commingled material collection, (2) collection from single family residences and /or multiple dwelling units, (3) the establishment of buyback or drop-off centers, (4) the construction and operation of materials recovery facilities, and (5) the implementation of community information and education programs. These five aspects of Attwoods’ recycling programs were especially important in obtaining the largest single curbside recycling contract in the United States. That program is located in Dade County, Florida. In addition to Dade County, Attwoods also has recycling programs in Florida’s Palm Beach, Duval, Hillsborough, Lake, Manatee, and Broward Counties, as well as in communities in Maryland, Pennsylvania, New Jersey, Delaware, and the District of Columbia. units in three areas: Adur, Worthing, and Arun District Councils. recycles over one billion pounds of recyclables annually. Mindis markets its products through a central salesforce of product specialists to a wide range of users, including steel mini-mills, copper and aluminum mills, newsprint deinking plants, and glass and plastics manufacturers. Curbside recycling programs, drop-off collection sites, and multimaterial buyback centers - most consumers consider these programs their only choices for recycling materials. But there are other options. Tri-State Recycling and Transfer operates a mixed waste processing facility in Galena, Kansas. Located in a 28,000 - square foot enclosed building, the facility takes in 200-300 tons of municipal solid waste each day. Recyclable materials are removed from the solid waste stream, processed, and sent to end markets. The recyclable materials that are extracted include: steel and aluminum cans; glass and plastic containers; several types of paper; corrugated cardboard; scrap steel, aluminum, copper, and brass; rags; and polyfilm. The steel cans and other steel items are removed from the solid waste magnetically before the other materials, which are then hand-sorted. Public service announcements have made consumers in Galena, Kansas aware that they are recycling “automatically” when they place recyclable containers in with their garbage. Consumers are encouraged to remove the steel lids from the glass containers so that the steel lids and the glass containers are more easily sorted for recycling. Once sorted, the steel cans are baled and shipped to various end markets, where they are recycled. Communities in the Midwest that are considering establishing waste processing facilities like Tri-State Recycling may be interested in a newly formed consulting firm called Duane Snapp Company. The firm was founded by Duane Snapp, former president of Tri-State. The scrap industry can boast of yet another recycling achievement - this time, the recycling of Chicago’s Comiskey Park, the oldest stadium in major league baseball. Once dismantled, the park’s steel will be recycled, according to a report in American Metal Market. By autumn, Cozzi Iron & Metal Inc. will have processed the stadium’s 5,000 tons of steel beams and girders, removing concrete and other extraneous building materials before cutting it into small lengths. Next, the metal will be barged down to Nucor-Yamato Steel Company in Blytheville, Arkansas via the Calumet, Illinois, and Mississippi rivers. The steel company will feed the remains to its electric-arc furnaces to be reformed into wide-flange beams for structural applications - maybe even a new sports stadium somewhere in the “field of dreams.” The modern Nucor-Yamato plant has the capacity to melt the entire lot of Comiskey Park scrap in one day. Steel cans have officially entered the list of materials that many scrap dealers will collect for recycling. But one scrap dealer has gone a step beyond collecting steel cans - this processor has demonstrated its enthusiasm through technological innovation. Atlas Iron Processors, Inc. headquartered in Cleveland, Ohio, has created a shredder specifically designed to shred steel cans and other post-consumer steel products (also called ferrous material) into an extremely clean product with uniform chemistry. cans from numerous community recycling programs in the Cleveland area. “While our shredding operation was originally designed to shred automobiles, white goods, and other miscellaneous scrap, we through it was important to explore other sources of raw material, so the operation was modified to also do municipal scrap,” said Paul Popovich, General Manager of Atlas Iron Processors. Once the steel scrap is delivered to the Atlas yard, the shredding system processes the material at high production rates and generates a unique grade of #1 shredded municipal scrap that is then shipped to local steel mills. Stokely U.S.A. has been bringing canned vegetables to the nation’s tables for over 80 years. Although the steel cans containing their products have always been recyclable; today, they are being recycled. Stokely wants to be sure consumers recognize this. Stokely’s Finest is a premium line of vegetables distributed throughout North America, as well as to international locations. Since 1990, these cans have featured the steelmark logo with a recycling message. A military base is no different than a city when it comes to implementing recycling programs. Residents, visitors, and members of out-lying areas must be taken into account. This is the case at the Naval Air Station in Jacksonville, Florida, where the recycling program includes curbside and drop-off sites for both military personnel and civilians. Since October 1988, steel and aluminum cans; clear, brown, and green glass; all types of paper; plastic containers; heavy and light steels; white appliances; and car batteries have been collected and processed for recycling. “Captain Kevin Delaney, the commanding officer of the base, implemented the program because recycling is good for the environment and because it reduces the cost of hauling waste to landfills,” said Master Chief Mo Armstrong. rate is 85%, and every building on base is recycling something. In the curbside collection program, residents of 408 military housing units can place their recyclables at the curb. Two bins are provided per house: one for steel and aluminum cans and plastic containers; the other for various types of paper. The recyclables are picked up once a week. A drop-off collection bin is located at the recycling center itself of the convenience of the 15,000 civilians who work on the base, the 32,000 retired persons who live in apartments located off the base, and the 15,000 reservists who stay at the base each weekend. In addition, a drop-off center with Igloo containers is located in front of the Navy Exchange Complex. An incentive program is geared toward office personnel on the base. Individuals bring their recyclables directly to the drop-off location at the recycling center and are entered into a drawing to win prizes like a free airline ticket and a weekend for two downtown. Originally created to promote office paper recycling, many office personnel also bring recyclables from home. A local elementary school is also involved in recycling at the base. Students collect steel and aluminum cans and plastic jugs, then bring the recyclables to the base. Base personnel pick-up, sort, and haul all recyclables. The steel cans are magnetically separated with a can flattener, then they are hauled to Commercial Metals in Jacksonville. Created because of environmental and landfill concerns, as well as for cost avoidance savings, the program has been recognized for its success through several awards: the National Recycling Coalition Business Award for Best Recycling Program in the U.S., the Secretary of the Navy’s Environmental Award for Non-Industrial Base, and the Keep America Beautiful Award for Federal, State, and Governmental Agencies. What do pineapples and steel have in common? One complements the other when they’re Dole pineapple products packaged in steel cans. Dole Packaged Foods Company has announced that it will be placing the steel recycling logo on steel cans containing its products. Among the products to bear the logo are Dole Sliced, Chunk, Tidbits and Crushed Pineapple products, Dole Pineapple Juices, and Dole Tropical Fruit Salad. These and other Dole products are distributed nationally. One hundred years ago when Geo. A. Hormel & Company began operation, environmental concerns weren’t the issue they are today. But Hormel, like many other environmentally responsible companies, has taken several steps to help preserve the environment. Hormel products, such as chunk salmon, chicken and turkey; chili; ham patties and canned hams; MARY KITCHEN(r) Roast Beef Hash; DINTY MORE(r) beef stew; and vending-sized steel cans all display the steel recycling logo. Plover, Wisconsin is home to one of Del Monte Foods’ can manufacturing plants and is a well-used steel can recycling location. Steel can scrap from the manufacturing process has long been shipped from the plant for recycling - and it still is today. But now this recycling program also includes post-consumer steel cans. By word of mouth, news of the program spread to the surrounding area, and as a result, various representatives from the University of Wisconsin in Stevens Point, St. Michael’s Hospital and several of the local public schools are now also using the plant as a recycling collection location for steel cans. The trailers that deliver US Can’s products carry two messages - US Can’s and steel’s. In major markets throughout the country, as the trucks make trips from the plants to their customers, the steel recycling logo is thus see by millions of Americans. 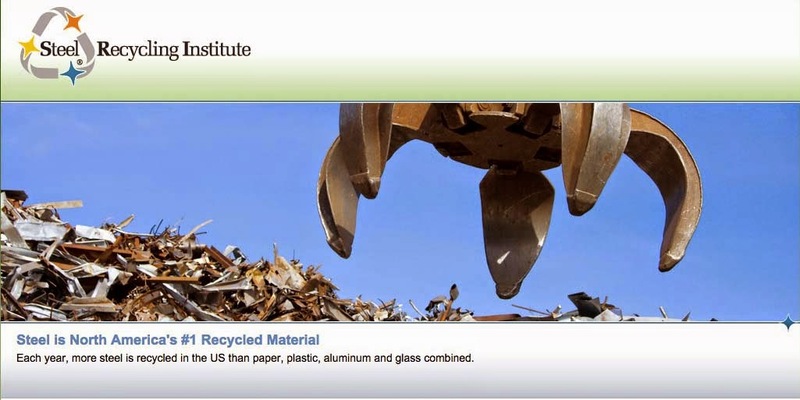 Recycling has reached across the nation, to homes, apartments, institutions and the U.S. military. One location in particular is Moody Air Force Base in Valdosta, Georgia, which is turning a fledgling program into an example of recycling initiative. In early summer, 1990, because of his personal environmental interests, Lieutenant Colonel Jon Lindsay suggested that the base start a multimaterial recycling program. Coincidentally, the Air Force Division of Morale, Welfare and Recreation (MWR) offered a plan for starting such a program. As in most instances of perfect timing, Lt. Colonel Lindsay has helped to institute a comprehensive multimaterial recycling program on the base that includes steel and aluminum cans, glass containers, office paper, computer paper, cardboard and plastic. Steel cans are being collected from various base locations, especially food and beverage service areas. Lt. Colonel Lindsay anticipates that a collection receptacle will be placed at the dining hall kitchen for containers used in food service, such as steel cans. The Recycling Committee has raised awareness through the base newspaper, bulletin boards, interpersonal communication, letters and the support of other departments and base leadership personnel. This program is voluntary - on the base and throughout the Air Force. While base personnel currently conduct the program, the base will shortly contract with the Air Force Defense Reutilization and Marketing Organization (DRMO) so that materials will be collected from the base by a hauler. The DRMO currently conducts the Air Force’s scrap metal recycling programs - such as for bulk ferrous metals.